Greek or Roman Gold Coins? 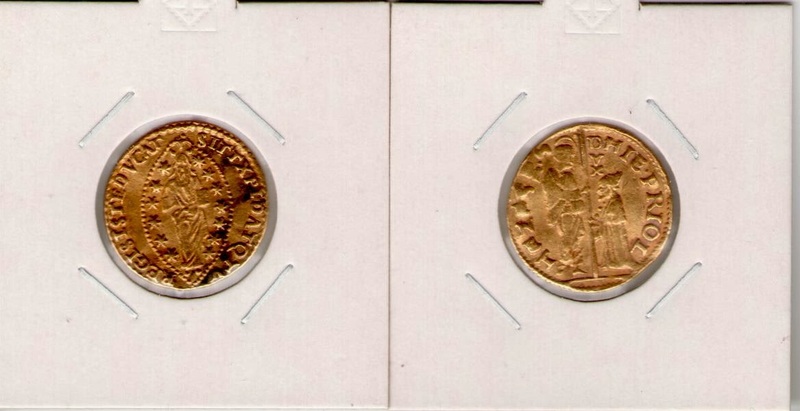 I was offered these two gold coins by my usual seller. He said that these were found among the treasure trove of Aceh gold coins. He was not sure where these coins originated from but he said they looked Greek or Roman. I am not sure either but I did buy these two gold coins from him. I am hoping there may be someone out there who can identify these two coins. These two were listed under British Bruney. For that reason alone, many buyers missed these two sets. In fact the seller had a third set which was made up of miniature sheet which I did not buy. The first lot was not expensive. It was only US$3 which I thought was a worthwhile buy considering the variety of the stamps. The second one I had to pay US$10, which I thought at first was a good buy because of the definitives set but when I looked at the set again, there is a stamp missing in the definitive set. Overall still a worthwhile buy and since these two came from the same seller, I only had to pay for one postage. This lot only cost me GBP1.41, cheap, but the postage will cost me GBP2.20. It is a good lot and I don't know why nobody wants to enter into the auction. The range is fairly wide and the used stamps are the 1947 varieties and after but overall it is not a bad collection of Brunei stamps for the price I paid for the lot. Not to complete any set but a nice filler nevertheless. I paid US$116.39 for this lot of 1906 Labuan Overprints on eBay recently. I was quite surprised to get it at such a low price. I would have thought there would be more competitors when this item came up on eBay. 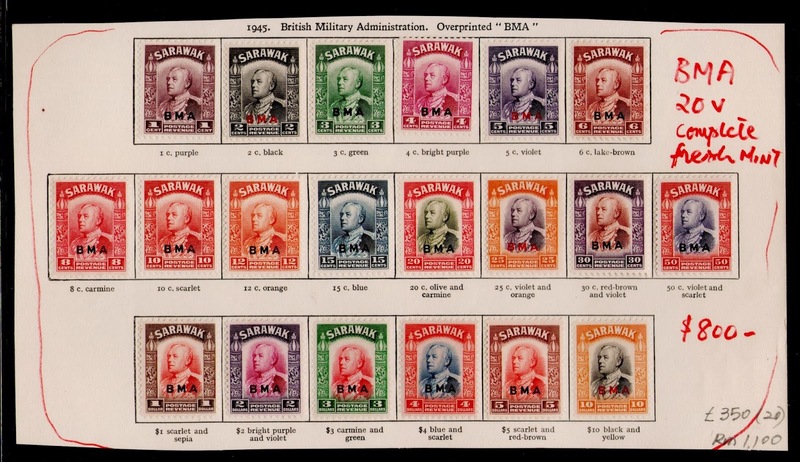 A full set of mint Labuan Overprints is currently valued at around B$925. This lot even has one used one dated 1911. To me what makes it rare is that there are only 2,000 sets issued. So this complete lot is a very rare one of 2,000. This makes it my third complete set. This lot of mint 1952 Begawan Definitives cost me US$11.51 from an eBay seller in Hong Kong. According to Steven Tan's International Stamp & Coins Catalogue, this lot should be worth M$170 which is roughly around B$65. So US$11.51 is a good price and good value. I have been buying a number of used Brunei stamps lots on eBay over the last few months. I have all of these stamps but I keep on buying just to add to my stocks especially the used Brunei stamps. These are always valued higher. At A$14.80 this lot is a little bit higher than what I would have like to pay for them but they are worth the price given that they are mostly 1924 and before that. This one is from Queensland, Australia. 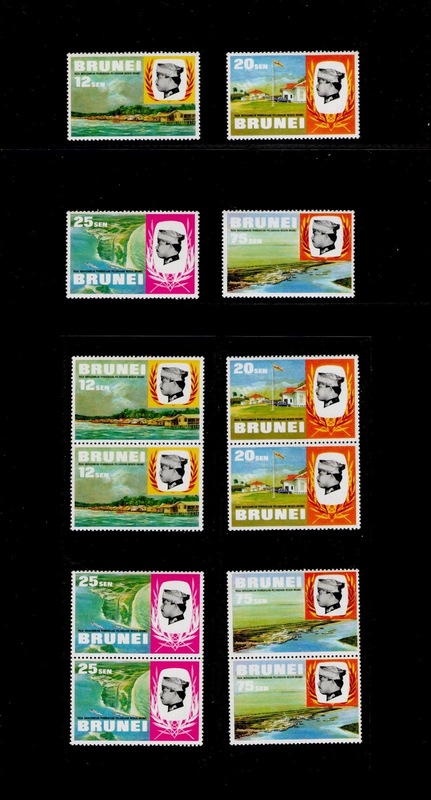 This is another lot of Brunei stamps I managed to buy from eBay. This one only cost me US$2.24 for the entire lot which I thought was a great bargain. I have too many of these stamps already but I don't mind as I am paying just above two dollars for these stamps which have a much higher value in total. A few pieces are from the 1947 series and the rest are Begawan stamps which could either be 1952 or 1964 which I can't tell just by looking at the photograph. I can only tell when they arrived in Brunei which will probably take about two to four weeks from Hungary. I won this auction recently on eBay for GBP29 from a seller in Belgium. Given that most of these are used Brunei stamps which are normally valued higher than mint ones, that is probably a good value though I have not valued them one by one. The stamps are combination of the 1895, 1906 and the 1907 to 1924 series. I look forward to adding these to my stocks of stamps. Yesterday I posted about how in 2006, China and ASEAN celebrated its 15th Anniversary of ASEAN-China Dialogue Cooperation. 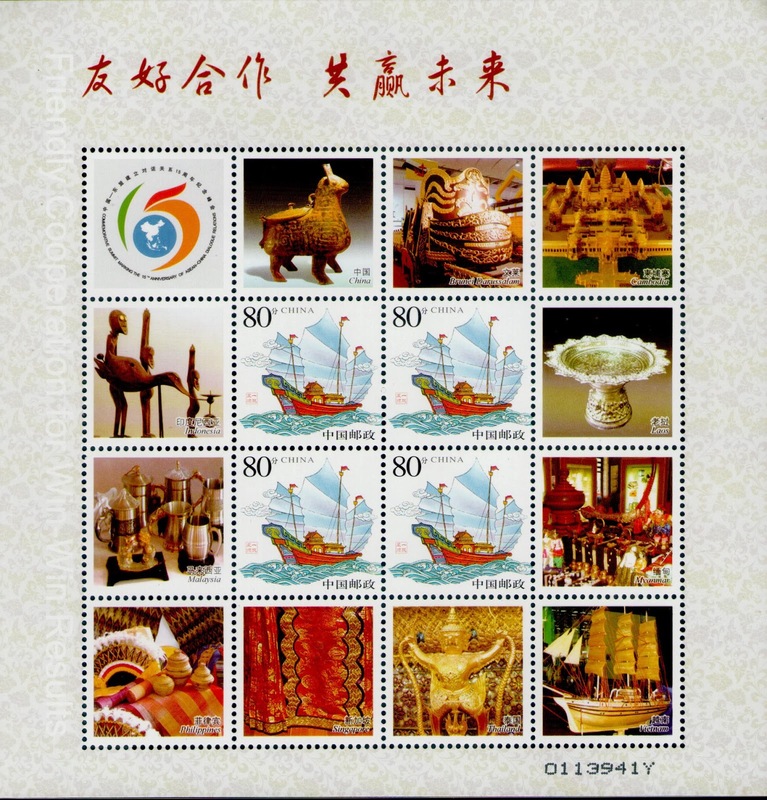 China issued a special stamp as well as two miniature sheets commemorating the occasion. 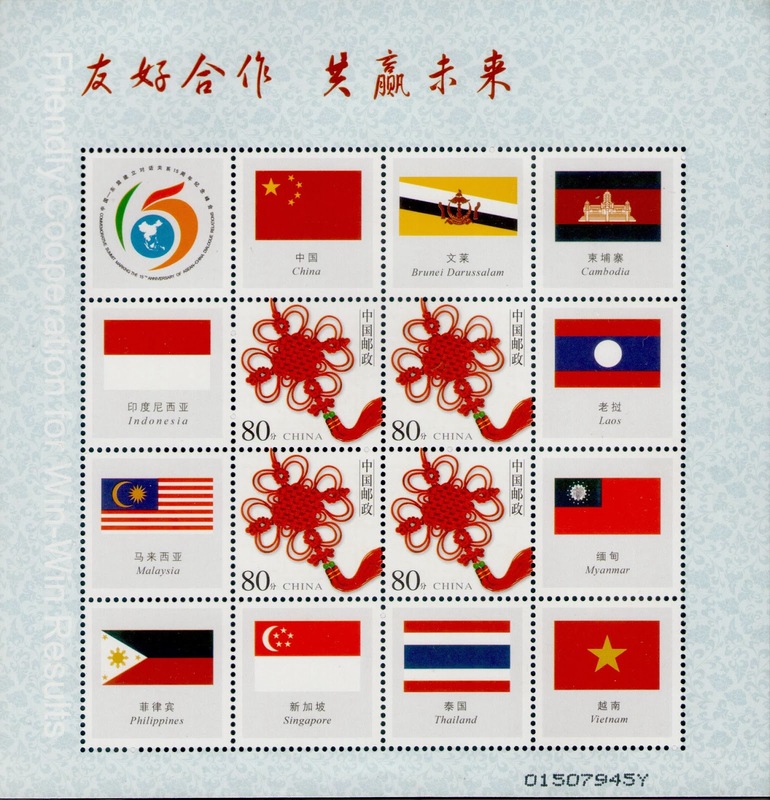 This is the second of that miniature sheet depicting the stamps of the flags of ASEAN member states. It is the Royal Chariot that is currently on display at the Royal Regalia Museum in Bandar Seri Begawan. In 2013, realizing the importance of preparation for entering into ASEAN Economic Community (AEC) in 2015, Thailand Post disseminated information about traditional costumes of AEC member countries through the National Children's Day 2013 Commemorative Stamp. This collection entitled "Children of ASEAN - Preparation for entering into ASEAN Economic Community (AEC) in 2015" portrayed cartoon characters wearing national costumes of the 10 member countries, including Brunei Darussalam, Cambodia, Indonesia, Laos, Malaysia, Myanmar, Philippines, Singapore, Thailand and Vietnam. Three Brunei 5 cents retouch from 1916, 1924 and 1933. These are all valuable and very difficult to find. The 5 cent chocolate were also used for the Japanese overprints and they are quite rare. 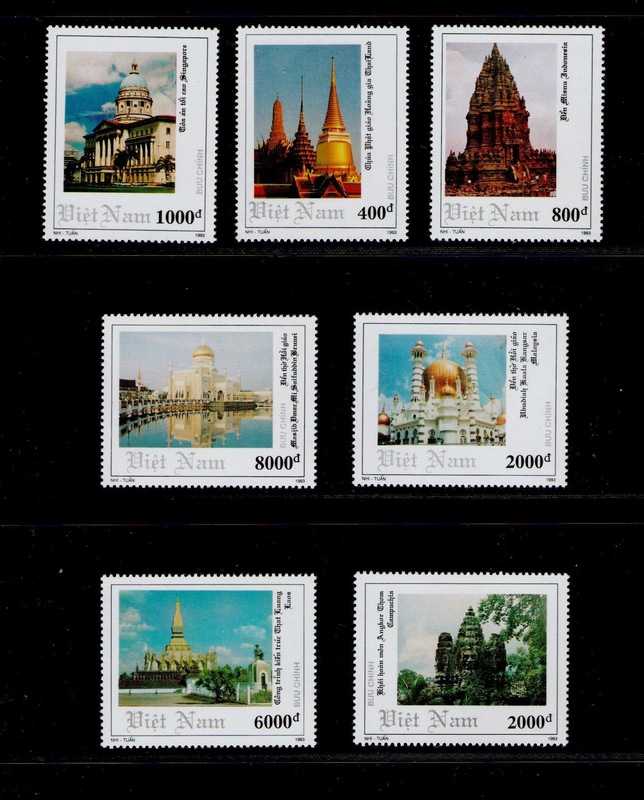 These 1993 Vietnamese stamps were issued showing the ASEAN monuments. Laos, Cambodia and Myanmar had yet to join ASEAN and there were only seven ASEAN member states then. For Brunei, the Sultan Omar Ali Saifuddien Mosque was chosen. This looks like a modern postcard of Brunei. But looks can be deceiving. This postcard is more than 30 years old, believe it or not. What gives this away are probably several things. One is the Royal Dais. The location of this Royal Dais is in front of the SOAS Mosque. Nowadays the Royal Dais is permanently in front of the Secretariat Building which the Mosque is now to the right of the Royal Dais. Secondly look closely at the flags waving in front of the Royal Dais. There is a Union Jack clearly visible. Only in pre-1984 was the Union Jack, the British flag was clearly seen as Brunei at that time was still a 'protectorate' of the United Kingdom of Great Britain and Northern Ireland. Finally, the uniforms. I am sure the uniforms have changed but I just don't know enough about military uniforms to describe the changes. 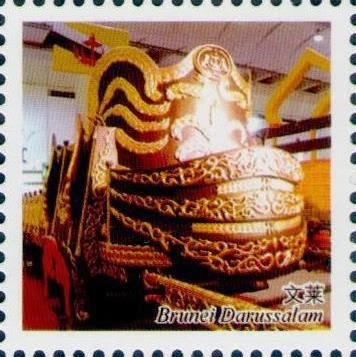 Additionally, which is not visible, the postcard was published by Dairy Farm, a company which no longer exist in Brunei. My best guess is that this postcard was printed about early 1980s. 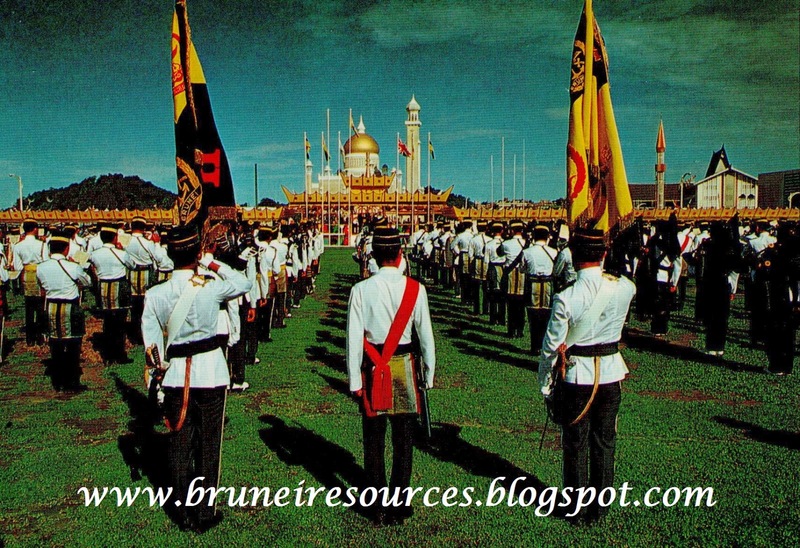 After the end of the Second World War, the Brunei government which was then the British Military Administration (BMA) used stamps of Sarawak and North Borneo in Brunei. The only difference between the original stamps and that of BMA was that the stamps were marked BMA in black or red. I wanted to buy a whole set of Sarawak BMA. One day I got an offer for the above set. I did not hesitate and quickly grabbed this. This Brunei stamp in my collection, believe it or not, has a catalogue value of B$1,000. It is quite rare and nowadays almost difficult to find. But when it first came out no one knew it existed let alone knew it will be worth that much. This 5 cent stamp was issued in 1916. What makes it rare is that little 5c (circled in white). When these stamps first came out, they were all printed together. However in some of the sheets that were printed, the 5c did not come out, the printer forgot to put the 5c stamp and the box was empty. Rather than throw those sheets away, the printer had to print the little 5c individually. At first no one realised. It wasn't until the 1950s, if I am not mistaken, that this little mistake came to light and everyone searched for the 5c stamp with what is now known as the '5c retouch'. The 5c retouch can also be found in some of the 5c stamps for the 1924 and 1947 series. 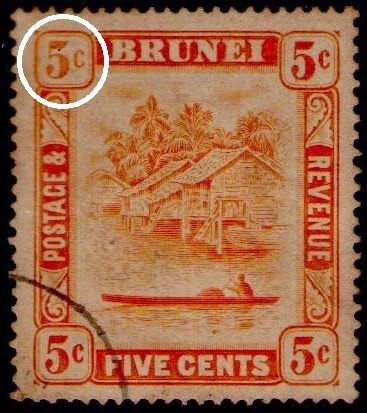 If you have a lot of Brunei's 5c stamps from this era, it would be worthwhile to have a look. All you have to do is look at the colour of that 5c in the top left hand corner and compare that to the other 5c in the other corners. If your stamp's 5c is lighter in colour, then it is likely that you have a '5c retouch' and you might want to keep it separate from your other much cheaper stamps. Many years ago I discovered there was a set of stamps which was unissued and supposedly that all the stamps have been destroyed. I was thinking whether these stamps would ever be found or whether there would be survivors. A few years ago, when I went to my stamp dealer which I always frequent whenever I go to Singapore, he showed me a set. I nearly fainted, It cost me an arm and a leg and I finally got that set. Surprisingly a few months after that I saw another set on eBay. The prices on that jumped so high that it went beyond what I would have paid for it which was about US$1000+. After that I did not see any more of these stamps.